For general building design SOFiSTiK offers various FEA-packages mostly based on the SOFiSTiK flagship solver ASE. Any package can be upgraded for special tasks like bridge design, dynamics or tunnel engineering. The SOFiSTiK package will be controlled via the SOFiSTiK Structural Desktop (SSD). The SSD is an all new working enviroment to control the different SOFiSTiK programs without being forced to use the text-based editor. The SSD allows the user a task-oriented way of working by offering various wizards or pre-defined task from a library. The SlabDesigner PRO is a powerful 2D FEA package handling the analysis of slabs, walls, frames or grillages. It comes with an AutoCAD-based pre-processor, CAD-based section generator, automatic superpositioning, interactive result viewers and automatic report generation. For those engineers not having AutoCAD, this package comes based on an optional AutoCAD 2006 OEM engine. This means: Full AutoCAD-technology and compatibility for a very competitive price. SlabDesigner PRO comes with many advanced features like non-linear cracking analysis for slabs and beams, non-linear bedding and supports, integrated t-beam design and theory 2nd order and many international codes like BS, EC, DIN, SIA, �NORM, ACI, BBK/BRO (Sweden), SNIP (Russia). The SlabDesigner PT Pro package offers additionally the option of analysing and designing Pre- and Post-tensioned slab with SOFiPLUS and SSD data input. For more information please check the Post-tensioned Slab Example on our WebSite. "Basic 3D FEA & Design"
Like the SlabDesigner PRO this package is AutoCAD-based and is an economic start into the 3D FE-analysis using SOFiSTiK. The package come with an interactive pre- and postprocessor and an automatic mesh-generator. The user can perform linear static analysis for any 3D structure, from simple slabs to freeform surfaces including RC-design for plate, beam and truss elements. Implemented codes are identical to the SlabPRO-packages. "BASIC 3D Frame and Girder Systems"
Based on the program STAR 3 the user has a powerful solution for analysis and design of general frame and girder systems according to 1st/2nd order theory at his fingertips. The input can confortably be done using SOFiPLUS. The SOFiSTiK Premium Package is available in two configurations, the first one as SOFiSTiK Premium Concrete (including the design of shells) and the second one as SOFiSTiK Premium Steel (including theory 3rd order and membrane elements). The Premium package can easily be upgraded to post-tensioning structures, seismic analysis, bridge and tunnel design. With COLUMN the engineer has a program interface of the new generation at hand. Based on the modules STAR3 and STUE the program offers column analysis and design according to the buckling column model procedure (DIN 1045-1) or 2nd Order Theory including non-linear material behaviour and creepage/shrinkage. 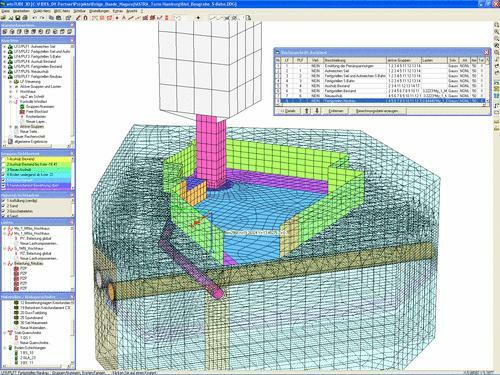 Further more COLUMN offers an option for automatically drawing reinforcement plans for SOFiCAD.